Carcassonne is a German-style board game, invented by Klaus-Jürgen Wrede, for two to five players. It received the Spiel des Jahres award in 2001. It is named after the medieval town of Carcassonne in southern France famed for its city walls. The game board is a medieval landscape built by the players as the game progresses. The game starts with a single terrain tile face up and 71 others shuffled face down for the players to draw from. On each turn a player draws a new terrain tile and places it adjacent to tiles that are already face up. The new tile must be placed in a way that matches, i.e. roads must connect to roads, fields to fields, and city walls to city walls. After placing the new tile, the placing player may opt to station a follower on that tile. The followers never move, and can never be stationed anywhere except on the tile just placed. A follower claims ownership of one terrain feature (road, field, city, or cloister), and may not be placed on a feature already claimed by a different follower. However, it is possible for terrain features to become shared after the further placement of tiles. For example, two disjoint fields which each have a follower can become connected into a single field by a later terrain tile, after which the united field is shared. When a terrain feature is completed, the followers claiming that feature earn points for the owning players, and are returned to those players to be stationed again later. For example, when a city wall forms a closed loop, the city is complete, and the player with the most followers in the city scores points based on the size of the city. If two or more players tie for the most followers, they all score the points. The followers are then returned to the owning players. The game ends when the last tile has been placed. At that time all uncompleted terrain features score points for the players who have followers stationed on them, and whoever has the most points wins. Carcassonne is an excellent family game, because the rules are simple, no one is eliminated, and the play is fast. A typical game takes only 45 minutes to play. It it published in the United States by Rio Grande Games. Rio Grande Games is the American publisher of Carcassonne and all of its variants and expansions. Their web site includes information and rules for all the Carcassonne products. 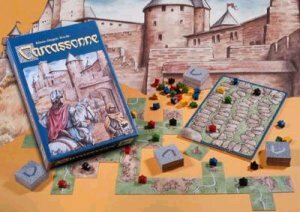 A community web site dedicated to the board game Carcassonne, its expansions, variants, and spin-off games. Includes annotated rules, plus an active forum where you can ask questions about the game and share your ideas with fellow gamers.